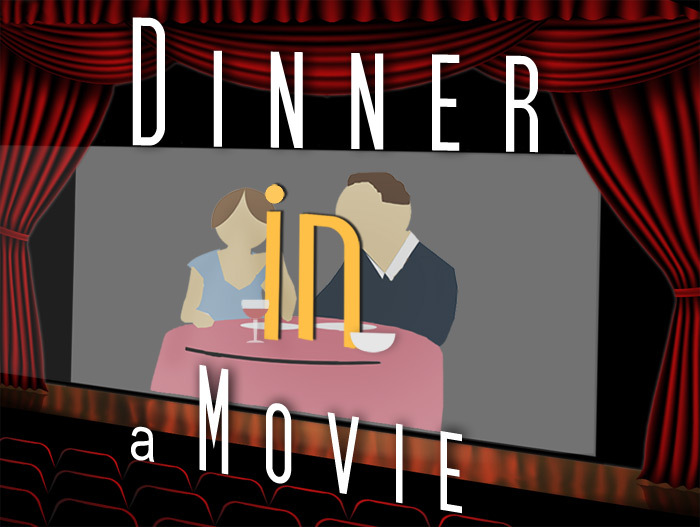 It's time for another Dinner In A Movie! 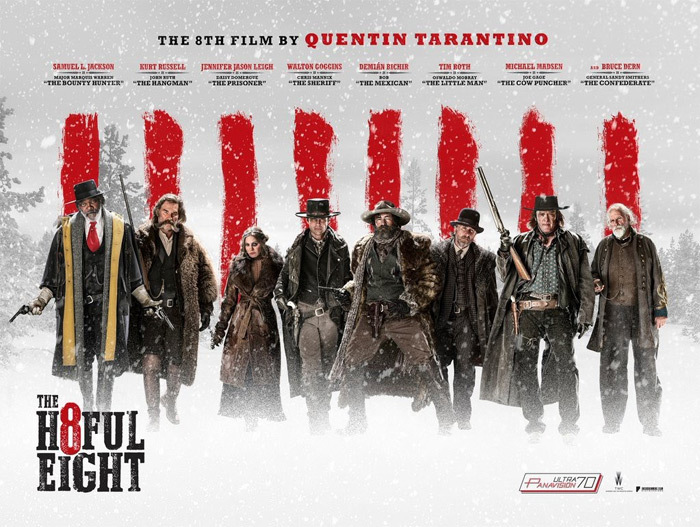 The Hateful Eight, directed by Quentin Tarantino, is a mystery of sorts set in the Old West. At first glance you may not think this movie appropriate for my Dinner In A Movie series but one of the most dramatic scenes in the movie involves stew. Without giving too much away, this movie which takes place mostly in one room, is the story of a group of eight colorful strangers who take shelter from a storm at Minni's Haberdashery. Working towards a brutally violent climax the characters one by one reveal their story. Though there was never a recipe given in the movie, this Jamie Oliver shin stew recipe is what I imagine they might have been eating. A rich and succulent stew that is fairly easy to make and tastes better the longer it sits. Each spoonful is loaded with flavorful vegetables and meat so tender it melts in your mouth. Preheat your oven to 350ºF. In a heavy-bottomed ovenproof saucepan, heat a splash of olive oil and gently fry the onions, carrots, celery, garlic, herbs, porcini and cinnamon for 5 minutes until softened slightly. Meanwhile, toss the pieces of beef in a little seasoned flour, shaking off any excess. Add the meat to the pan and stir everything together, then add the tomatoes, wine and a pinch of salt and pepper. Gently bring to a boil, cover with tinfoil and a lid and place in your preheated oven for 3 hours or until the beef is fork tender. Taste and check the seasoning, remove the cinnamon stick and rosemary sprigs and serve. Oh my husband would flip for that stew! 2/3 bottle of Chianti? Well, I'm 3/3 ready for some of that! Mmm! We haven't seen this movie yet but it really sounds intriguing. Even better with a bowl of this stew! I don't REALLY have a desire to see that movie. But I DO have a desire to eat the CRAP out of that stew! I think that this is exactly what they would have been having! I'm a big Jamie Oliver fan, and this recipe sounds great --- love that cinnamon stick! My daughter saw the movie and thought it was a bit odd. She's normally a fan of Tarantino's but for some reason she didn't dig this one. I haven't seen it yet. I'll likely wait till it comes out on the tube. I'll have to whip this up the night we watch it. 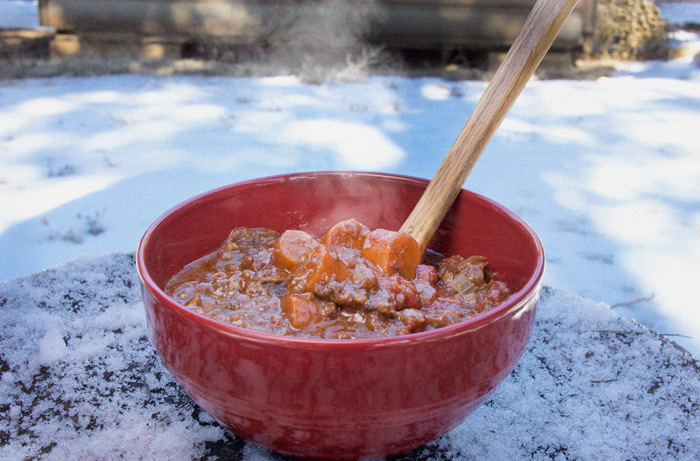 I absolutely stew, it's one of my favourite things to eat in winter. This one looks scrumptious. perfect match! lovely recipe and great movie too! This recipe looks delish! We're both Jamie fans! I'm so out of the loop on popular movies these days. I didn't know that Tarantino had a new movie out. This stew sounds great - especially with the wine base! I love your post and the recipe is to yummy! We are expecting snow this weekend This will be perfect to warm everyone after shoveling! Quentin Tarantino a favorite in our house too! Another mouthwatering recipe from one of our favorites, Jaime Oliver! Thanks for this hearty and comforting stew; it just went on our "must make" list! You had me at "2/3 bottle of Chianti!" I love any stew that Summer's with red wine! This stew looks hearty and delicious. Love the addition of chianti and plenty of veggies too. I think you are spot on imagining this dish would be in that movie. And it looks great.